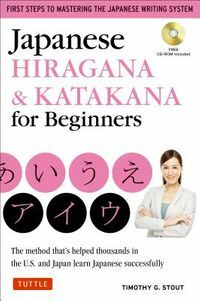 This is a user friendly guide to learning Japanese Katakana and includes a set of 46 flash cardsJapanese Katakana for Beginners makes learning of beginner kana fast and effective by using memorable picture mnemonics, along with clear explanations, examples and lots of fun exercises a method that has helped thousands of students lean katakana successfully in the United States and Japan. 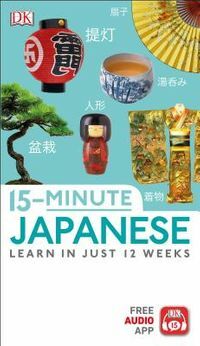 Picture mnemonics enhance memory by associating the shape and sound of each Japanese kana character with combinations of images and English words already familiar to students. 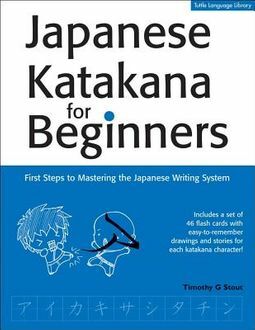 This book is organized into three main sections:The first introduces the basic 46 katakana characters along with writing tips and opportunities to practice writing them.The secondteachers the usage rules that allow students to write all Japanese sounds, providing more opportunities for practice.The third strengthens students' skills through a wide range of exercises (word searches, crossword puzzles, fill in the blanks, visual discrimination, timed recognition quizzes, etc) designed to both increase the knowledge of the Japanese language and reinforce newly acquired writing skills.A set of flash cards printed on perforated cardstock and a list of suggested flash card activities, are also provided at the end of the book. Each of these cards introduces a katakana character along with the picture mnemonic that helps to recognize and remember it.